Pebble Paving Company...at your service for over 35 yrs. One of the longest warranties (10 yrs.) you can trust--nearly everything except ground movement, Act of God or your own damage (and all of that can be repaired or capped). Installed only by fully-trained, US-citizen professional employees who care as much about your home as they do theirs. 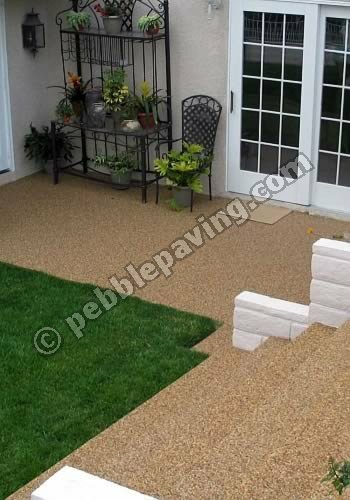 Pebble Paving installed in any color, including labor and materials, costs less than pavers, concrete, tile or flagstone installed by licensed contractors. Often MUCH less. Minimums apply. The 2-part epoxy is mixed on site, then combined with the natural quartz gravel and troweled right over your existing surfaces, creating a dazzling epoxy stone flooring unlike any other. 99% of our installations are completed in one day, ready for use the very next day. There is no week-long 'prep', no mess, no jackhammering out of the old product, no multi-day 'cure' time, no long-lasting delays which define other surface treatments...and other companies! Remember- long cure times can spell disaster from weather, animals, accidents or a combination of all three. We believe the best product is the best advertising. And we believe we offer it!